Siopao Heaven: Will Erap ever learn? As the deadline on filing of candidacy for the 2010 election becomes nearer, Most of the public figures are one by one revealing their true intentions for the coming election. One of them is the former 13th president Joseph "Erap" Estrada. For those who were living under a rock or playing World of Warcraft or other similar internet games, Erap "stepped-down" from the presidency last January 20, 2001 and was succeeded by Gloria Macapagal Arroyo. 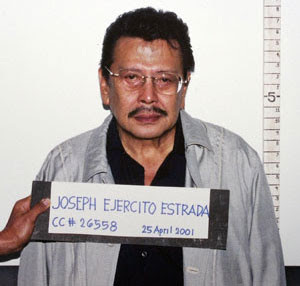 Erap vacated the seat of power due to the pressure of the impeachment charges and the so called Edsa II. Today, he officially announce his candidacy for the upcoming presidential elections because the people "told him to". Now the question is, Will the people still vote Erap after what happened last 2001? Will the other candidates allow him to run for office? Let's just say he won again, will the same impeachment happen again? There are so many questions that are rising now and as far as I can see, Erap is a liability in the so called "Genuine Opposition". The votes are going to be divided as Noynoy, Chiz, Erap and Vilar all wanted to win the presidency, and as for Gloria, she's confident that her sole candidate Gilberto Teodoro will get the undivided votes from their supporters. God save our country.